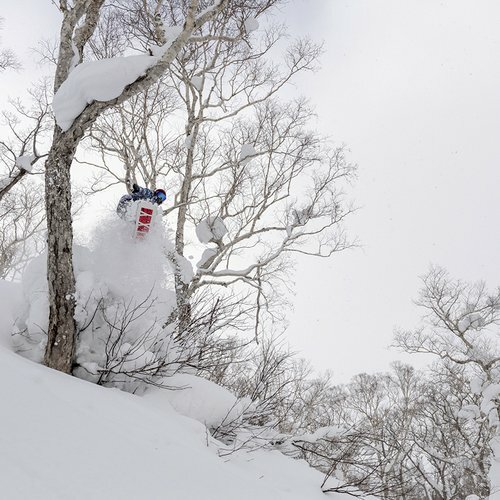 Niseko HANAZONO Resort is part of the Niseko United group and lies on the North Eastern side of Mount Niseko Annupuri. 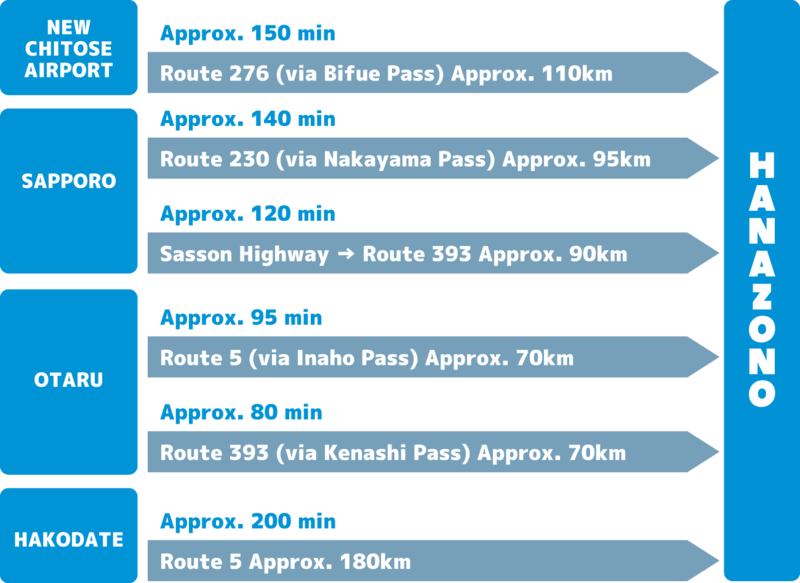 You can either ski across from Hirafu or catch the HANAZONO Shuttle Bus, which is in operation between Hirafu and HANAZONO every 20 min between the hours of 7:50am and 5:10pm. There's fewer shuttle bus operating between the extended open period. Please note that service interval may be about 30 min during this week. 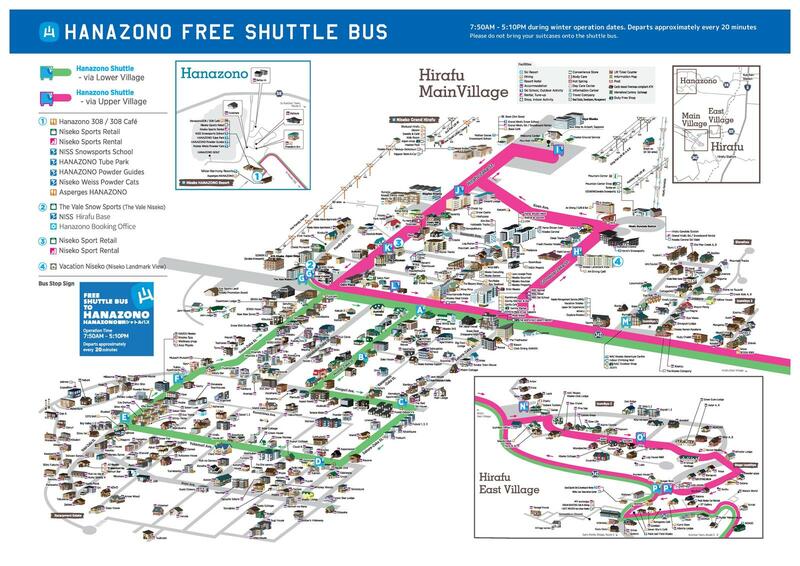 We've made it hassle-free to start your day during winter, with 6 free shuttle buses running guests to HANAZONO 308. We have the entire Hirafu village and surrounded area covered with a bus every 20 minutes; operating through the upper and lower village to transport guests from their door direct to HANAZONO. 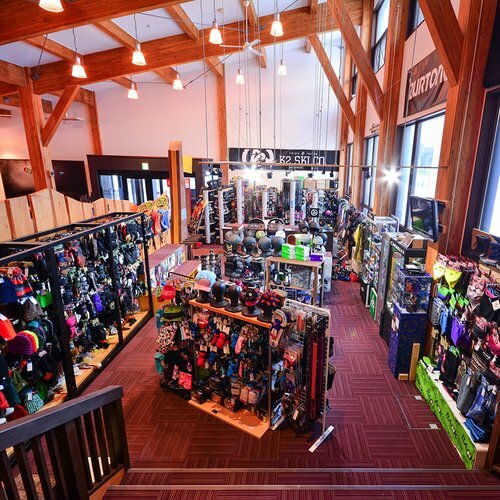 No one will have to wait or walk far to start their day, this service is ideal for the family or the keen POW enthusiast with the first bus arriving at HANAZONO at 8.20am in time for first lift at 8.30am. The HANAZONO Shuttle operates daily from 7:50am to 5:10pm. 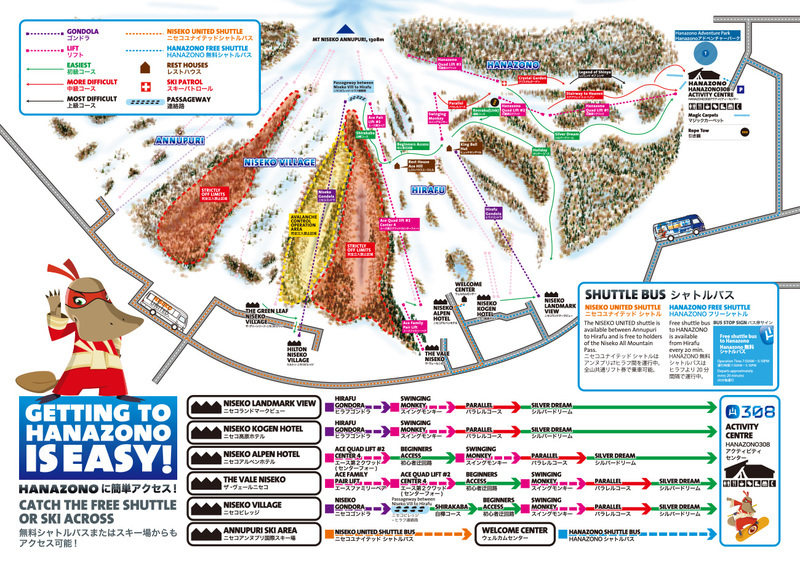 Niseko HANAZONO Resort is part of the Niseko United group and lies on the North Eastern side of Mount Niseko Annupuri (far right-hand side of the trail map below) and can be accessed via the lift system with a HANAZONO / Grand Hirafu Lift Pass or Niseko All Mountain Lift Pass. Confident beginners: From Hirafu, take the Hirafu Gondola followed by the Swinging Monkey, turn right off the lift onto Parallel Course (red), then the Silver Dream (green). Intermediate and above: From Hirafu, take the Hirafu Gondola or Ace Quad Chair followed by the King Hooded Triple, turn right onto Youtei Sunset (red), then follow the signs down to HANAZONO. Rental cars can be hired from Kutchan, Sapporo or New Chitose Airport and are an inexpensive and convenient option for those who are comfortable driving in the snow and wish to explore the area. Please be aware that the roads can be icy and dangerous in the winter. We advise that you make sure the rental car has all-wheel drive and snow tires. Use the following MAPCODE number for directions to HANAZONO on your car navigation system. 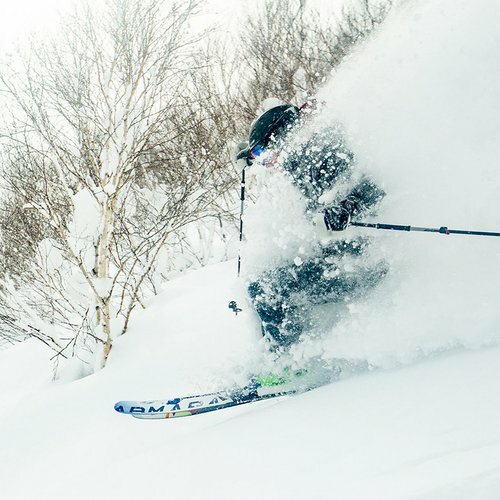 The coach services are very efficient and provide a frequent schedule to the resorts in the Niseko area during winter. The typical journey takes around 2.5 – 3hrs. Whilst convenient and hassle-free, all coach transfer options are scheduled services departing at set times, which may not suit all guests. Click on the link below for a range of different services to cover all guests' needs and cut down on the wait time. Hakodate Line is the main rail artery of Hokkaido, running through the Niseko area, it offers easy access to Hakodate, Sapporo, Otaru, Asahikawa and other major cities in Hokkaido. 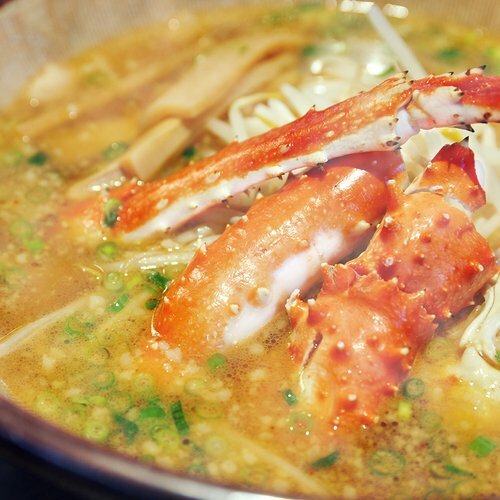 Kutchan station is the most convenient stop when traveling to/from Niseko, just 10 min drive to HANAZONO and 15 min drive to Hirafu Village.